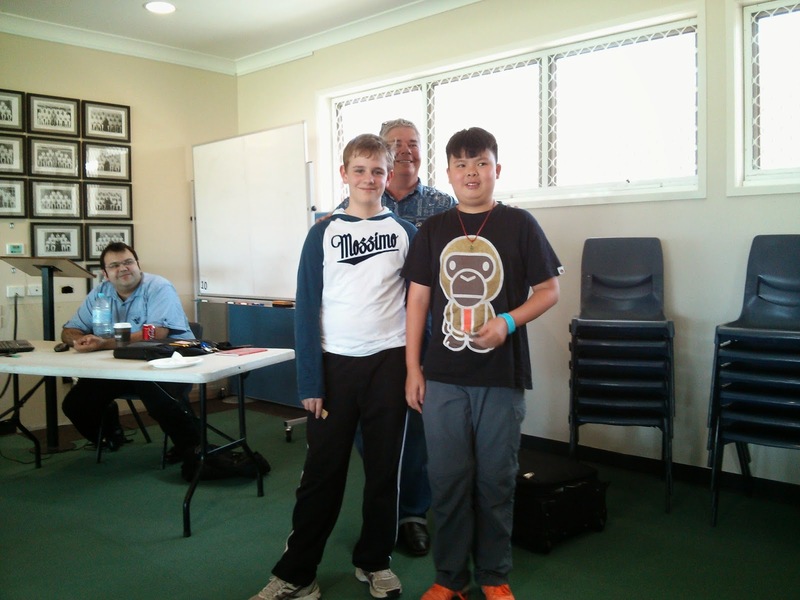 Second place was a tie between Hughston Parle and Alexander Au on 5.5/7. They took home $75 each. Best Girl was won by Brigitte Watkins with 4/7. This a remarkable performance by the Somerville house girl against a very strong field especially considering she had a splitting headache for most of the event. 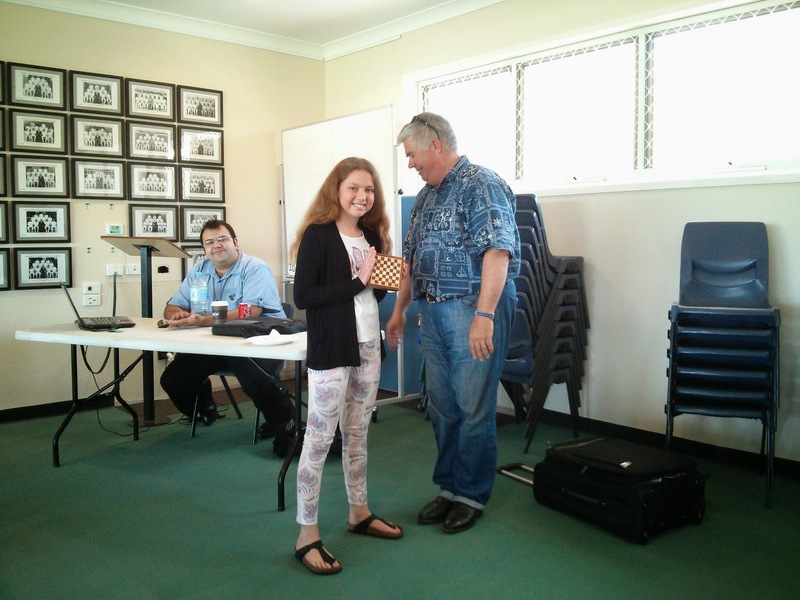 Second place was won by Isabel Stevens with 2.5/7 and for her fine effort she was rewarded with Kevin Casey's " Australian Chess Brilliancies "
The U800 division was won by Churchie boy Reece Cameron Lyons who's rating of 547 only shows that this talented youngster doesn't get the opportunity to play many tournaments. 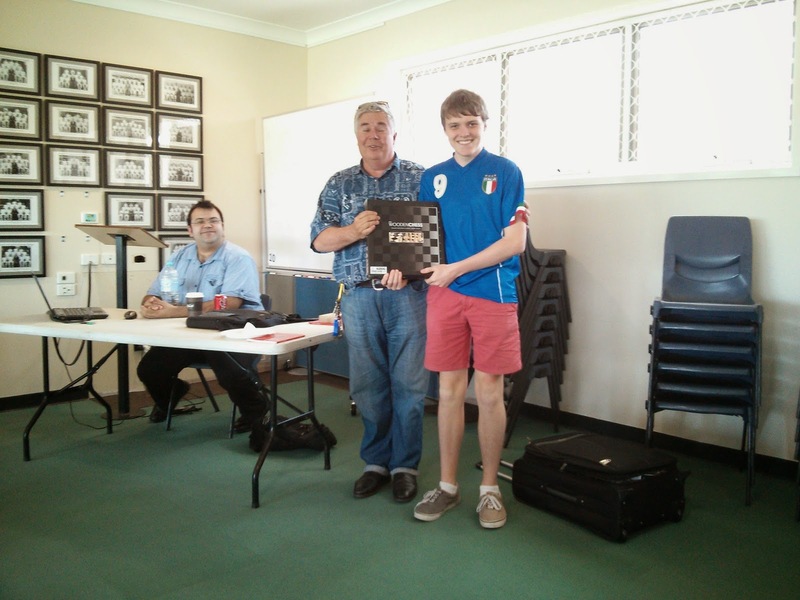 Reece took home a wooden chess set. Second U800 was taken out by Ben Stevens of Grammar. 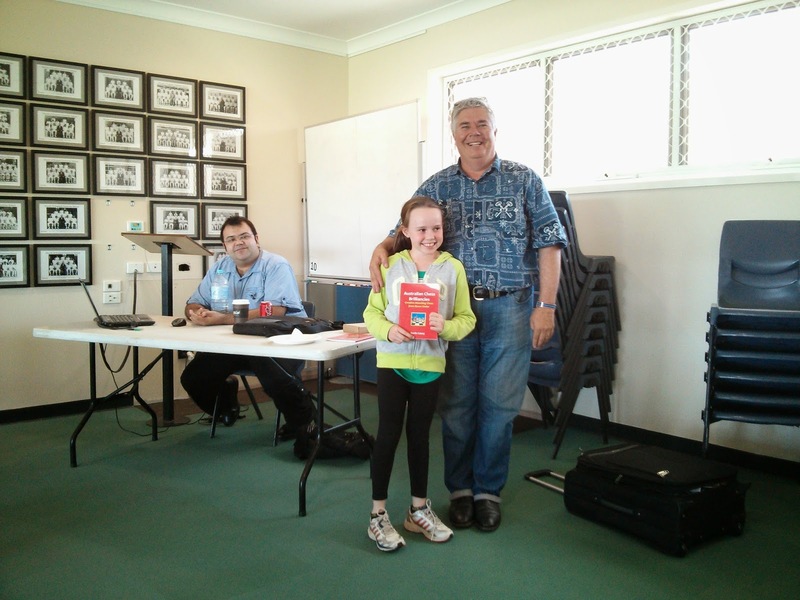 He also took home a copy of "Australian Chess Brilliancies ". 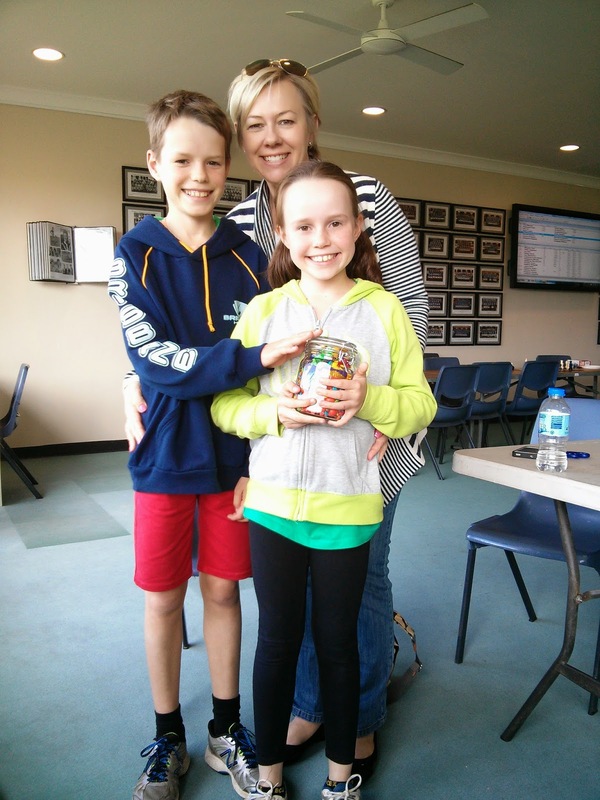 Isabel also showed a remarkable ability to guess the amount of lollies in a jar. Special thanks must go to our Arbiter Tyson Walker. It is a pleasure to have a consummate professional running a tournament. The Master of Chess at Churchie Max Condon put in the most work of anyone, organising and setting up the excellent venue and grilling sausages for lunch. Thanks also to Max's daughter, Grace Condon, ran the canteen all day long. 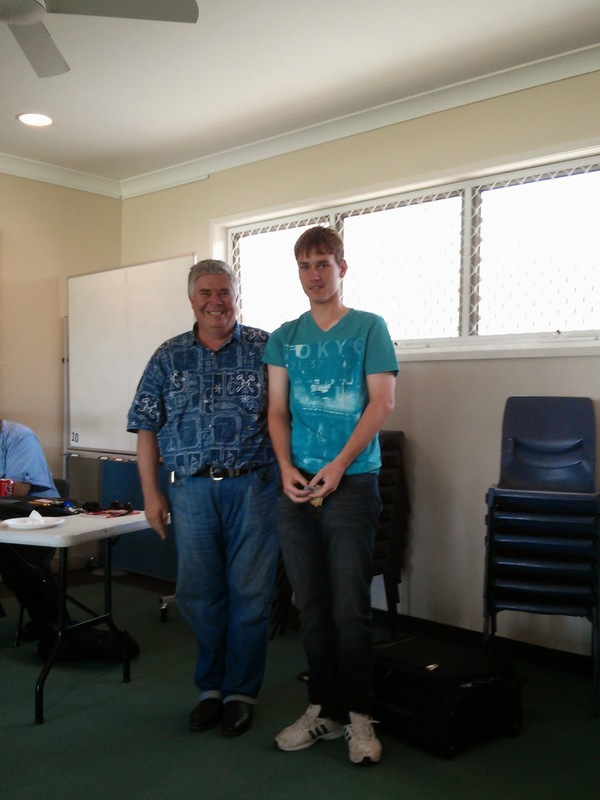 Churchie has a long tradition of supporting Chess an this weekender continues this. Thanks for making the Brene Pavillion available to us. It is a roomy quiet venue next to the main oval and the tuckshop. Waiting parents were able to use the free wi-fi provided. Summing up I believe all had a great Sunday. We did not have as many entries as hoped but this may have had a few contributing factors. We announced the tournament very late and clashed with fathers day and another junior event on the Gold Coast. As a "proof of concept" event however it was a success. All aspects of the tournament ran smoothly so we know the next one will be even better. The next Sunday rapid is scheduled for the 26th of October.